Product & Design Quality - Great quality. Just what we needed. Customer Service & Shipping - Your staff is easy to work with. Customer Service & Shipping - Customer service was great. We called with a question and service representative spent much time with us answering the question. Shipped in a sturdy container and packaged well. Customer Service & Shipping - Great company, awnsered my questions and helped me pick the product that works best for me. Customer Service & Shipping - I did everything online. Received our product when they said it would come. Customer Service & Shipping - excellent! Customer Service & Shipping - Everything was great & real Helpful on customer service & shipping. Customer Service & Shipping - Service was great. Received package much quicker than ever expected. Am very happy with my first experience of shopping with Tuff Flags. Customer Service & Shipping - The customer service was outstanding! I haven't recieved the type of service and assistance like I experienced with Tuff Flags in a long time. Good down to earth people. I highly recommend Tuff Flags to everyone. God Bless America! Customer Service & Shipping - The customer service is great and the shipping was fast. I am extremely happy with this product and will put it to the test in 2 days to see how long it stays lit during the night. Customer Service & Shipping - This was our first order with Tuff Flags and was happy with the transaction. Customer Service & Shipping - I received the light sooner than I expected. It came well packaged and I'm extremely happy with the results. I put it up over the weekend and it looks great.Highly recommend this product and your company. Customer Service & Shipping - All items arrived quickly. Customer Service & Shipping - Customer Service is great, fast and easy shipping. Customer Service & Shipping - this too was great came on time. Customer Service & Shipping - very good customer service. Shipped quickly. received faster then I expected. Customer Service & Shipping - Received in timely fashion as hoped for. Customer Service & Shipping - Excellent customer service - very helpful and knowledgeable. Customer Service & Shipping - GREAT!!! Customer Service & Shipping - My light arrived in excellent condition and arrived quickly as well. GREAT PRODUCT! Customer Service & Shipping - Iâ€™m not sure how or when I will need to replace any of the bulbs. The illustrations were a little vague. Customer Service & Shipping - Received quickly. Packaged well. Customer Service & Shipping - Great customer service - after hours, during hours - great people! Customer Service & Shipping - Excellent, received my order very quickly. Would definitely recommend Tuff Flags. Customer Service & Shipping - Friendly easy to work with staff. Customer Service & Shipping - Very friendly and polite thank you. Conversation was not rushed but the shipping was got it in less than 48hours cross country. I would definitely recommend this product and company to others. Again thank you. Customer Service & Shipping - The light shipped and arrived on time. Customer Service & Shipping - I ordered online and everything was easy. rec'd my order quicker then expected and would recommend them to anyone. Customer Service & Shipping - The flag shipped quickly and arrived without any damage. Placing the order was pretty simple as well. Product & Design Quality - They are heavy duty, work well. Will be purchasing more. Customer Service & Shipping - Excellent Customer Service and prompt shipping. Customer Service & Shipping - Fast shipping and excellent online communications, advise and instruction. All concerns were addressed before I bought the product. Customer Service & Shipping - The product arrived on time. Customer Service & Shipping - I had trouble with the shipping on the first one but it worked out well with the help of Charles. Customer Service & Shipping - Customer service was great when we placed our order...professional and helpful! A great transaction! Customer Service & Shipping - the best! Customer Service & Shipping - Very Fast and prompt! Customer Service & Shipping - Good. Received it within a week of placing order. Customer Service & Shipping - Customer service is excellent. And how many companies would come and hang a flag for a customer?? ?Thank you Charles! Product & Design Quality - Great product! Customer Service & Shipping - On time and super fast! Customer Service & Shipping - The website was easy to use and the customer service via chat interface was great. He was very responsive, answered all my questions, and wasn't pushy in the least. Shipping was prompt and the items were safely packaged. We will definitely continue to order from Tuff Flags. Customer Service & Shipping - Customer service was outstanding - very easy to work with - answered all my questions and flags were received quickly. Product & Design Quality - This is a beautifully constructed flag. I purchased a smaller one for my local community garden's brand new flag pole, and then purchased this one for our local Fire Department's flag pole. The guys at the Fire House were thrilled and put it up immediately. I intend to purchase this larger one for our community garden next season. Thanks a million. Customer Service & Shipping - Service is superb. Product & Design Quality - Product is great. Service is superb. Customer Service & Shipping - Prompt delivery . Customer Service & Shipping - Shipping was fantastic less than 2 days! Customer Service & Shipping - Could not ask for better people to purchase a great product from. Customer Service & Shipping - I am the Newtown teacher you personally called about possibly donating the flag pole if it was for a school. It was a gift for my dad, but you discounted it and it meant so much to me that you did this so near the anniversary of Sandy Hook. This is always a very hard time for all of us. Thank you again. Product & Design Quality - Great product! Super helpful staff! 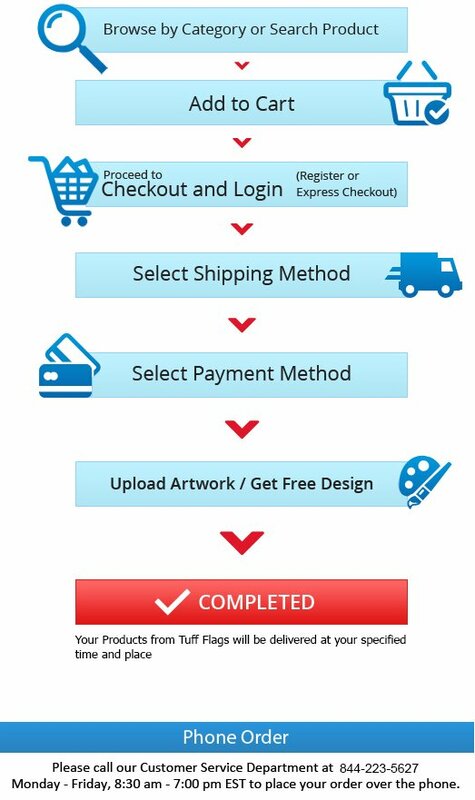 Customer Service & Shipping - Very easy transaction! Arrived early. Customer Service & Shipping - Easy to work with, super friendly and helpful. Customer Service & Shipping - Timely and effective. Customer Service & Shipping - Your company and staff were a delight to work with! Customer Service & Shipping - Customer service is GREAT!! I called a few days ago about not selling an Air National Guard flag and the lady in customer service took care of it the same day I called. It was listed right on their web page the very next time I looked. How is that for customer service? They really listen to their customers! THANKS! Product & Design Quality - I was a little disappointed in the construction of the grommets and how they were attached. The flag did not hold up well in the extreme windy conditions we have. However, I was given a replacement with a more durable construction. Customer Service & Shipping - Customer Service was superior. They understood the problem and corrected it immediately with no hassle at all. Shipping was excellent. I highly recommend this company for your flag requirements. Customer Service & Shipping - Customer service was great! She was knowledgeable and happy to help in any way. From the day I called the delivery was in 7 days or less! You have a customer for life. Customer Service & Shipping - Received it within a week of ordering it. Unheard of customer service! Customer Service & Shipping - Customer service is second to none with complete satisfaction as their primary driver. Charles in particular was awey!! Product & Design Quality - Outstanding quality, it even has the velcro along the edges so I can use my existing side panels. Customer Service & Shipping - Outstanding, fast and great price. Customer Service & Shipping - Customer Service was outstanding. They were really helpful and patience with me through out the entire buying process! Customer Service & Shipping - Top Notch!! Customer Service & Shipping - The service I received was outstanding. They went over with me my order to make sure I was happy with the product and the design. There were also follow up calls to insure the product was delivered on time and it was correct. Product & Design Quality - quality flag, better than my last one i ordered off line. Customer Service & Shipping - Very Pleasant person to work with over the phone. Customer Service & Shipping - Happy with the customer service and shipping. Product & Design Quality - I have purchased cheaper units and as the saying goes " you get what you paid for". I am happy with the design and quality as well as the ease of installation. Illumination factor is far better than previous units I have used. Customer Service & Shipping - I am very happy with the customer service and the prompt delivery of my order. Customer Service & Shipping - EXCELLENT !!! Customer Service & Shipping - Customer service is top notch. I called customer service prior to ordering because i was concerned with size of light. All of my questions were answered quickly and professionally. Delivery was on time. Customer Service & Shipping - The light came very quickly and well packaged. Product & Design Quality - We really love our custom flags. The quality was great. We also ordered US flags, in which the material is nice an thick. Customer Service & Shipping - The service provided has been exceptional since we first reached out to guys for proofs. It was over a month before we actually placed our order, while in-between. Your company reached out to ensure it wasn't anything else we needed. Shipping was on point. I would recommend this company. Thank you again! Product & Design Quality - fantastic..... loving all of it! Customer Service & Shipping - very very good , Randi has been awesome all the way!!!!! Customer Service & Shipping - They go way beyond the norm to make sure everything is satisfactory and taken care of. Good personalities and you can tell they really care about what they are doing and enjoy their work and creativity. Customer Service & Shipping - I worked with Charles Fretterd on this order. I began chatting with him through the online chat, requesting podium banners (s) that I needed for a conference the following week. He worked tirelessly throughout the afternoon and evening to get this order to the art department, get my approval, and begin the printing process. I spoke with him originally on October 19th for a conference scheduled for October 27th. He had the banners shipped to me at the hotel and they arrived on October 26th and were just what I needed. I've never received such wonderful customer service from any company that I've ordered from. He went above and beyond to make sure that the order was what I asked for and it was delivered on time. I couldn't ask for more than that! Many thanks! Product & Design Quality - Top notch, exactly what I wanted. Customer Service & Shipping - Quick and easy! Turn around was very prompt! Product & Design Quality - Very nice quality. Customer Service & Shipping - Ordered online and received it very quick. Received emails with when it was shipped and when it would arrive. Product & Design Quality - I was very pleased with my purchase. Great quality material. I will be ordering all my flags thru here. Customer Service & Shipping - Shipping was fast. Customer Service & Shipping - At first my order got lost, but it was all taken care of in one phone call. Great customer service and received the flags over-night just in time for our Veterans celebration!!! Great job! Product & Design Quality - Better than we imagined and constructed. They helped further my business plan and model providing a better image. Product & Design Quality - Awesome product and fast turn around! Customer Service & Shipping - Excellent communication for a custom product- it turned out exactly as we wanted it! Fast shipping! Customer Service & Shipping - Super fast! I had my items in under a week which is unheard of for custom! Product & Design Quality - The products seem to be exactly what we ordered and we will definitely use your company again when the need arises! Product & Design Quality - The tent turned out great, the colors are vibrant and it shows off my logo beautifully. Money well spent! Customer Service & Shipping - The customer service was excellent - always prompt in responding in the friendliest manner and are very knowledgeable about their products. Product & Design Quality - Very Good! Found you on internet search. Like Made in USA, contributing factor in purchase. Customer Service & Shipping - Very good, even on follow up email question/answer. Product & Design Quality - Ordered for church property for Memorial Day, Veterans Day, and Independence Day. Pleased with quality of all flags! Customer Service & Shipping - Professional and friendly as always! A pleasure to do business with! Product & Design Quality - Product was just what was needed. Customer Service & Shipping - Customer Service was outstanding. Randi communicated well on the status of the order and order was shipped as needed. It was a pleasure doing business with Tuff Flags! Product & Design Quality - Beautiful craftsmanship, worked perfect with our 2-Aerials. Customer Service & Shipping - Excellent customer service and fast shipping. Product & Design Quality - Perfect! Great quality and amazing customer service. I would highly recommend Tuff Flags! Customer Service & Shipping - After placing an order online I received a personal phone call from Tuff Flags. I truly appreciate that they took the time to clarify the order and discuss shipping prior to processing! Thank you Tuff Flags for the amazing flag and working to ship it out as quickly as possible! Product & Design Quality - Product exceeded my expectations! Great quality! Customer Service & Shipping - I was blown away how quickly I received my custom garden flag. Great customer service! Product & Design Quality - Every thing is perfect, maybe think about sewing a heavy duty cable in inside for less stress on the corners. Customer Service & Shipping - Awesome company to work with! Would definitely recommend them for any other purchase your department is looking for. Product & Design Quality - Product arrived as expected. Customer Service & Shipping - Customer service is top-notch! Product & Design Quality - Design was exactly as described and the flag is high quality. We have had it hanging outside since we received it and it has held up well to the weather. Customer Service & Shipping - The flag was received by the time promised. Prompt delivery. Product & Design Quality - The flags we received from Tuff Flags were very high quality...reinforced where the flags usually fray. We will be back! Product & Design Quality - Tuff Flags did an excellent job in producing a high quality product. I have had many compliments on our flags. I would highly recommend them to anyone that is looking for quality flags. Product & Design Quality - This is a very beautiful flag that is of high quality. It looks great on both sides and the sun light shines through like a stained glass window. I am so proud to fly this flag under the American flag! Customer Service & Shipping - Customer service is the best!! I called once about them not carrying the 3x5 ft. Air National Guard flag and it was taken care of and on their web sight the same day. They do listen to their customers concerns. I will always buy from this great company. The shipping is fast also. I am a very happy customer. Product & Design Quality - These flags are absolutely beautiful! They are very well made of Nylon and the sun shines through to really make them bright. The colors are great on both sides no matter how you look at them. I will always come back here to buy my flags and accessories. Product & Design Quality - Excellent. Durable, attractive, quality material. Product & Design Quality - the best! Product & Design Quality - Product is great. Product & Design Quality - Product seems well made. The blue color is bright and the grommets are secured properly. Customer Service & Shipping - I had no problems purchasing these flags. Delivery was a promised. Product & Design Quality - Well made, quality materials. Product & Design Quality - Nice construction and sturdy product made a nice addition to my office. Customer Service & Shipping - All as expected and on time. Only concern was state flag appeared to have gold fringe online at order but when receiving it did not., but I made it work to match my IS Flag set. Product & Design Quality - Love our Flags!! Good quality!! We have them displayed with PRIDE!! Customer Service & Shipping - Excellent!! Product & Design Quality - Good Quality material, Flew great in a wind as low as 3 mph! Customer Service & Shipping - Great support and many questions answered by Randi. Pleasure to deal with. Product & Design Quality - These were absolutely perfect. Most places I tried to get these from had no clue what I was talking about. Product was great! Will for sure be ordering more from here in the future. Customer Service & Shipping - The customer service was excellent, I got all the help I needed and fast. This made ordering super easy! I needed flag poles the next day and you made it happen. Thank you for all your help! Product & Design Quality - Yes, The flags are beautiful and the quality is amazing. Product & Design Quality - Flag looks well designed. Will have to see how it holds up in the weather. Customer Service & Shipping - Good customer service. Product & Design Quality - . Product & Design Quality - Much better replacement bracket. Product & Design Quality - Very High quality especially in comparison to comparably priced flags. Customer Service & Shipping - very reasonable and arrived when estimated. No need for customer service. Product & Design Quality - Have not installed but quality of all three products looks great. Product & Design Quality - Good enough. Customer Service & Shipping - Amazing! Randi was a breeze to work with and went the extra mile. We at LithtexNW couldn't be happier. Thank you! Product & Design Quality - good stitching and printing. neatly packaged. Product & Design Quality - Outstanding design and superior quality with flag and hardware. 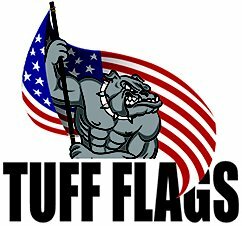 I would do additional business with Tuff Flags in the future. 8" x 12" U.S. Memorial Flags- Gold Spear, No Fray- 5/16"x24"
Customer Service & Shipping - No problems! Product & Design Quality - The flag was of good quality. Its been flying in high and low wind, snow and ice with no problems. Customer Service & Shipping - Haven't had to work with customer service. Ordered our flag online and it was shipped within the time frame given. Product & Design Quality - Excellent! Colors came out vibrant and sharp! Customer Service & Shipping - A+++ They took my concerns about timeliness very seriously. Product & Design Quality - Wonderful! Product & Design Quality - Very impressed with the flying eagle. Heavy, well-made and painted and decorated in a realistic manner. The disk light gives off a bright light and completely lights a 3' X 5' flag. Product & Design Quality - Best looking flag pole in town! Product & Design Quality - Lights were exactly as described, we put them on our new flag pole and they light the flag beautifully. I would certainly recommend them to my friends. Customer Service & Shipping - Received my lights before my pole was ready, so had time to charge them. Great service! Product & Design Quality - Due to the cold, we haven't been able to install the lights on the flag pole yet but everything looks good. Product & Design Quality - Great quality! Colors are vivid and design is as promised. Product & Design Quality - I sent a rough draft and design team was responsive to the changes. We ordered 50 flags for a class reunion. Product turned out great. Glad they could produce the small quantity. We ironed the flags upon receipt because we needed to use them right away. Customer Service & Shipping - Customer service was very helpful and responsive. I had a hard deadline for the flags and when placing the order I said "Tell me now if you can't make in time because one day late I won't need them anymore." They said they could meet the deadline, then called to let me know when they shipped and they arrived several days ahead of deadline. I really appreciated that call about the shipping! Product & Design Quality - Received the flagpole solar light in fine shape. the unit is well built and went together fine. The mounting straps were way to big, so I used smaller straps to mount the unit. I'm using the light to light up a Mobil Oil flying horse emblem fifty feet away on my father-in-laws garage from the pole I mount the unit on. The adjustable focus head was great to adjust the beam to the right size. My father -in- law loves it. Will see how it stands up outside in the cold weather. Customer Service & Shipping - The emails to update on when the unit shipped and to track it were a big help. Product & Design Quality - Quality was very good. We were very happy with the artwork and quality. Customer Service & Shipping - Went above and beyond to get me my order on time. Product & Design Quality - Great materials, very satisfied with the price and quality. Highly recommend! Customer Service & Shipping - Great customer service and shipping on point. Customer Service & Shipping - Very satisfied, prompt and courteous. Product & Design Quality - I couldn't be happier! They helped with execute the design I wanted and the quality of the product is top notch! Sturdy base but lightweight so its easy to carry in and out of events. Customer Service & Shipping - Super fast shipping! I had my custom products within a week of ordering. Product & Design Quality - Great product and quality was very good. Customer Service & Shipping - I had a very tight deadline and customer service helped prioritize my order so it was delivered in time. I will be using Tuff Flags again. Product & Design Quality - really good quality-price RS. Product & Design Quality - I was very satisfied with dealing with very professional and knowledgeable staff, products availability and quality is excellent. Customer Service & Shipping - fast shipping. Product & Design Quality - I'll need to wait until spring thaw to take my flag pole down to install these units but I'm looking forward to them being perfect for my needs. Customer Service & Shipping - Fast service and delivery!